Will a historic Supreme Court ruling finally force California's prison system to clean up its act? The word "gulag" conjures images of dank, slimy Russian prisons overrun with rats, teeming with inmates confined to tiny cages and standing in puddles of their own urine—not a scene normally associated with the United States. 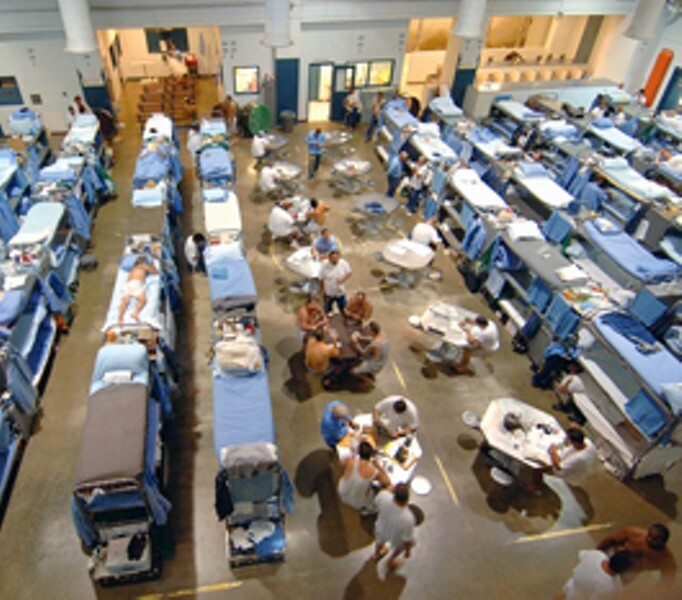 But according to a Supreme Court ruling issued on May 23, overcrowding in California prisons has led to gulag-like conditions, constitutional violations and treatment of inmates verging on cruel and unusual punishment. In a 5-4 majority ruling written by Justice Anthony Kennedy, the Supreme Court stated that the governor must reduce the Golden State's prison population by approximately 33,000 inmates over the next two years after revelations of rampant Eighth Amendment violations in the prison system arose. Three photographs were appended to the court's majority decision in Brown v. Plata, showing prisoners crowded into gymnasiums stacked one on top of the other in "ugly beds," and telephone-booth sized cages with no toilets where inmates on suicide watch are held for long periods. (After 24 hours, one inmate ended up catatonic and standing in a puddle of his own urine.) In the decision, Justice Kennedy describes a broken prison system where thousands of prisoners are denied access to the most basic medical and mental healthcare. "A prison that deprives prisoners of basic sustenance, including inadequate medical care, is incompatible with the concept of human dignity and has no place in civilized society," he writes. With one of the largest prison systems in the world, California houses more than 143,000 prisoners in facilities designed for less than 80,000, according to the Prison Law Office. Monday's ruling says that the population must be reduced to 110,000. "All the Supreme Court has done is essentially affirm what people have been saying for a decade," says Ruth Wilson Gilmore, author of Golden Gulag: Prisons, Surplus, Crisis and Opposition in Globalizing California. "The ruling puts into motion, with force of law, recommendations from all kinds of people, including Republicans like George Deukmejian." A fear-mongering backlash to the ruling has erupted among conservatives, originating from comments made in a dissent by Justice Antonin Scalia, who called the decision "staggering" and "absurd." In a heated statement from the bench, Scalia said that the released "will not be prisoners with medical conditions or severe mental illness, and many will undoubtedly be fine physical specimens who have developed intimidating muscles pumping iron in the prison gym." Gilmore, one of the founders of abolitionist prison organization Critical Resistance, which seeks to "end the prison-industrial complex," says that she is outraged by not only Scalia's comments, but those made in a separate dissent by Justice Samuel A. Alito Jr., who wrote "the majority is gambling on the safety of the people of California." "Fear is central to this, and fear is racist," Gilmore tells the Bohemian. "You know as well as I do when someone says criminal, the image that comes to people's minds is a black man with big muscles." Reached by phone, David Spady, California director of Americans for Prosperity, a taxpayer-advocacy group funded by evangelical Christian media company Salem Communications, says that the Supreme Court ruling enables the state government to "release prisoners onto the streets when they [the government] run out of money." "We think it's an outrageous and potentially dangerous situation that they are putting California into," says Spady. "The governor and the Legislature's first priority should be public safety." But according to Jeanne Woodford, San Quentin warden from 1999 to 2004 and who is now the executive director of Death Penalty Focus, public safety is not an issue. "When you look at 2009, 47,000 inmates went to state prison for 90 days or less, and that isn't public safety," says Woodford. According to a study by the Center for Evidence-Based Corrections at UC Irvine, California leads the nation in sending parolees back to prison. Parole violators now represent 67 percent of all admissions. Woodford testified in the Brown v. Plata case, she says, because overcrowding during her tenure as warden prevented the provision of constitutionally adequate mental and physical health services to inmates. She describes how inmates were corralled into the gymnasium and even the historic chapels at San Quentin when they ran out of room. Prisons operating at 190 percent overcrowding (a figure affirmed in the Supreme Court ruling) are a "powder keg waiting to go off," says Woodford. One way to comply with the court ruling lies in Gov. Brown's realignment plan, now awaiting funding after being passed by both Legislature and the governor, says Woodford. The state plan calls for diverting some short-term, low-risk felons to county jails or home detention rather than prison. Others like Gilmore say the transfer of inmates to county jails is not enough, and that it's time to examine why people end up in prison in the first place. "There are all kinds of things that are criminalized now that were not before this big prison build-up," she says. "Somebody might have gotten a ticket in 1978 for something that would send them to prison in 2011." Since statistics overwhelmingly show that a disproportionate number of those that end up in prison are poor, illiterate or suffering from mental-health issues, the ruling could provide an opportunity for California to look at why these people have been shoved away in cages and "ugly beds." Alcohol- and drug-treatment programs, mental healthcare and alternative community sanctions are all ways that those being funneled into and out of prisons can be rehabilitated within the community instead. "Ninety-five percent of the people that come to our prisons leave our prisons, and most people come and go within a year," says Rebekah Evenson, staff attorney with the Prison Law Office, whose director, Donald Specter, argued the Brown v. Plata case. "All the research shows that sending people to overcrowded prisons, where they are getting no rehabilitative programming because all of the space for providing programs is filled with bunk beds, only increases recidivism and crime," says Evenson. "By taking a hard look at who we send to $50,000-a-year prison beds, and how we treat our prisoners, we can actually improve outcomes while saving money by incarcerating fewer people and providing more community-based approaches."